Well, we had to play. So we did. 🙂 And if you’ve already played a bit yourself, you’ll know it didn’t take long for us to get hooked. It also didn’t take long for me to start wondering about how this could be turned into something mathematical. 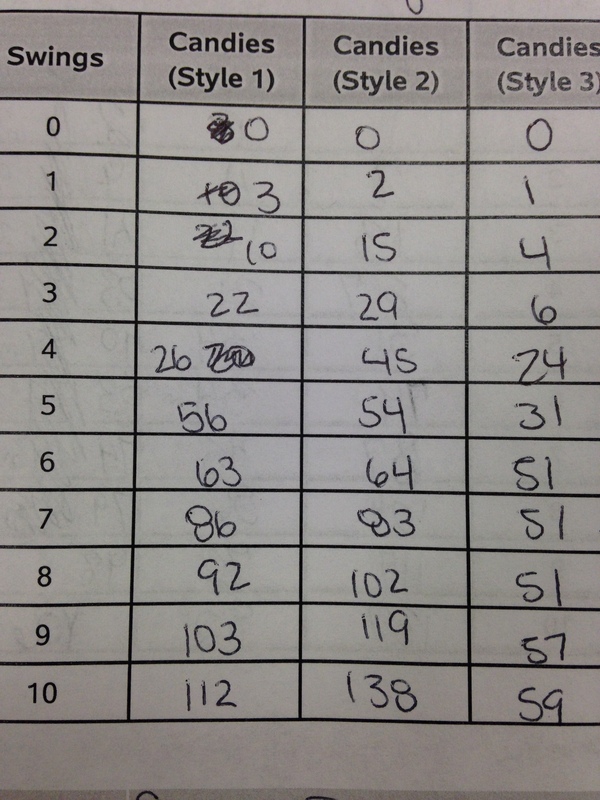 I mean, student engagement (with the game, at least) was instantaneous. Could I somehow leverage that into an engaging activity? I think I can. In fact, I think I can turn this into something worth exploring in Algebra 1, Algebra 2, Precalculus, Statistics, and even Calculus. All I really need: more data. During second period I work primarily on organizing/building/developing curriculum for our math department (all two of us!). I also oversee a few students’ independent study coursework (mostly in AP Statistics, plus a few in Honors Precalculus… highly capable students whose schedules didn’t work with the time we regularly offer the course). 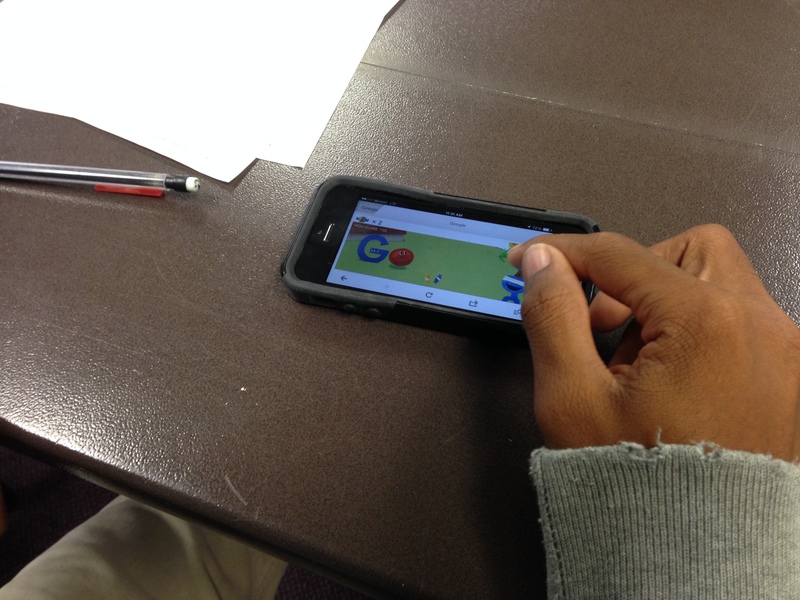 I grabbed a few kids as they walked in the door and pointed them toward Google on their laptops. 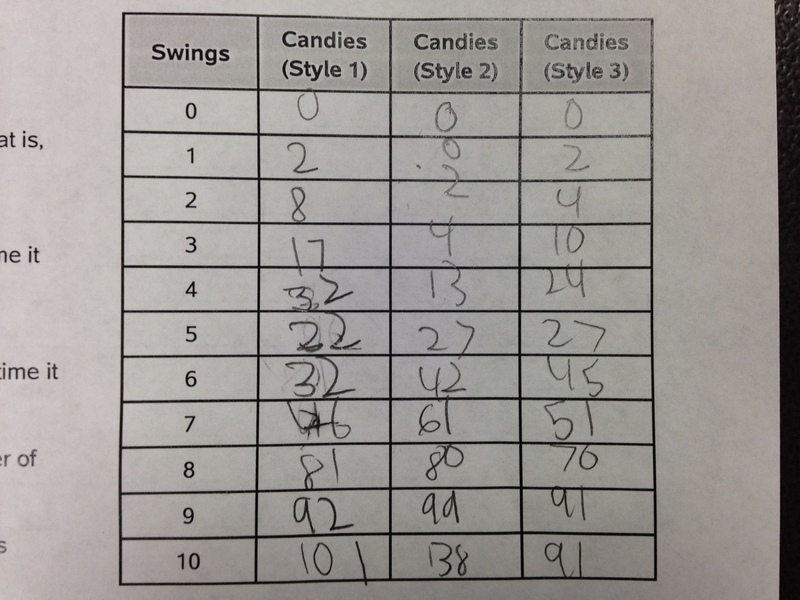 As they began playing, I started working on a data collection handout and formulating how I might turn this into an activity. About ten minutes later we had this handout. Learn the attack styles (All Out Attack, Delayed Attack, and Over the Top). Details for all of these are on the handout (link above, image below, video far below). Select an attack style, and attack! 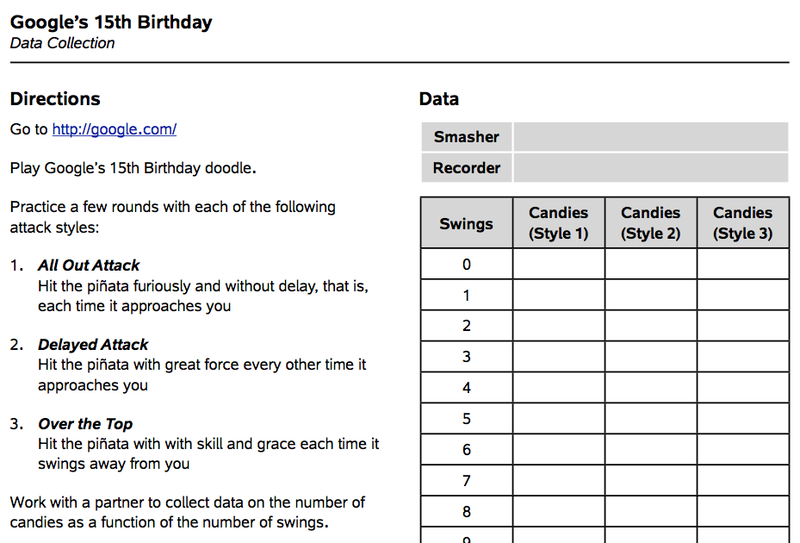 While the smasher is smashing,the recorder will do his or her best to record the total number of candies that have spilled out after each of the 10 swings. Ideally, students will play a game with each attack style (there’s room for one of each in the data table), and then trade roles. (Since the numbers scroll/animate almost continuously—if you’re not terrible at the game—it’s pretty difficult to accurately record the number of candies for All Out Attack. 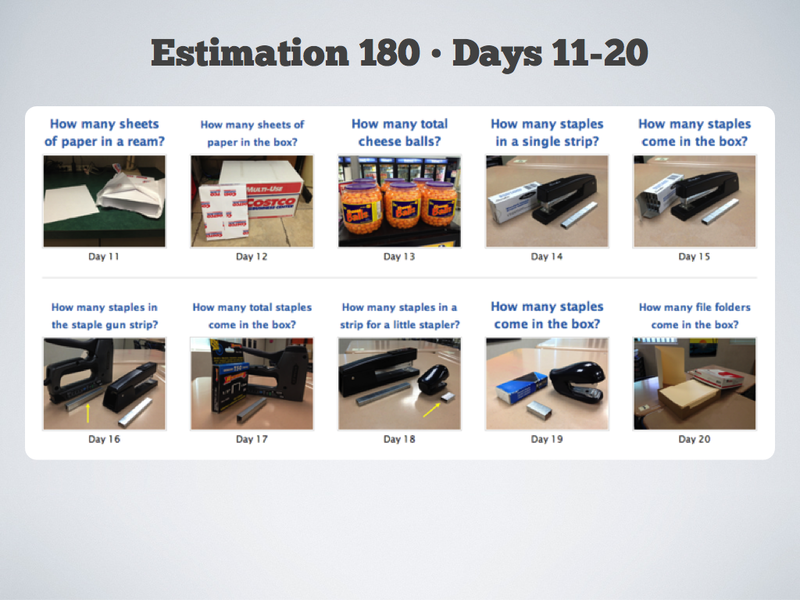 I asked students to make their best estimate and most seemed able to handle it. I then printed a few copies, and a few bits of data started rolling in. A full lesson in Precalculus (third period) meant no room for messing around with Google’s birthday doodle. Too bad. Maybe next week (if the doodle is still accessible, which I believe it will be). 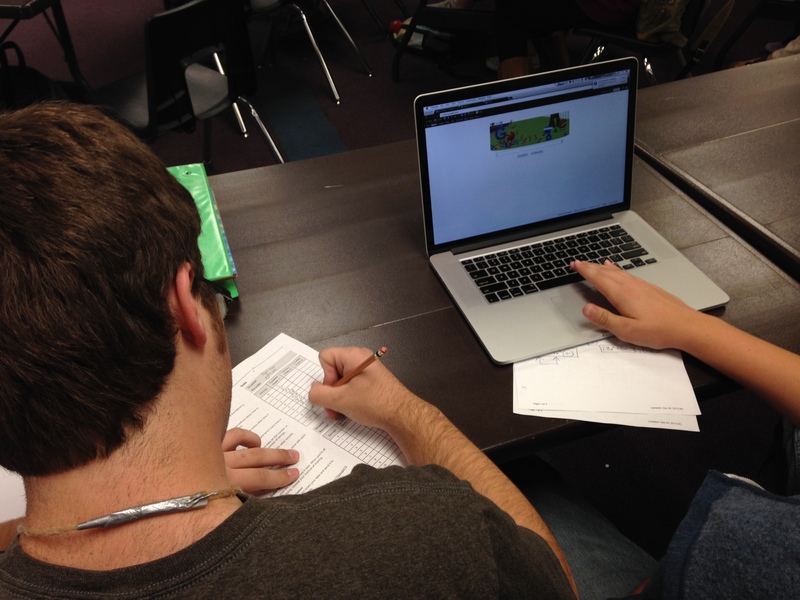 I carved out three minutes at the end of Algebra 1 (fourth period) to introduce the game to students, distribute copies of the handout, and invite students to play with a friend or family member at home. I have no idea if they’ll take me up on this. I imagine quite a few students will play this evening and tell me about their highest scores on Monday. 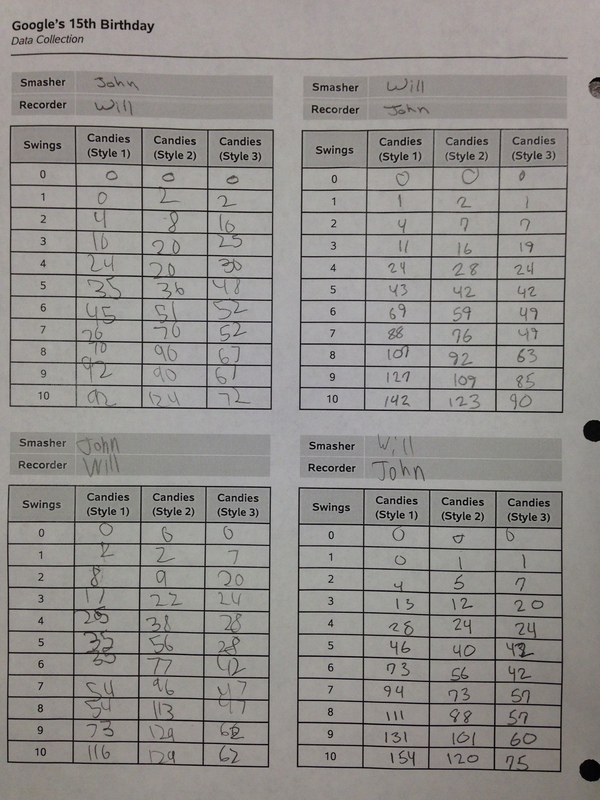 And when I ask if they recorded any data… This. We were supposed to work on corrections for our Chapter 2 Assessments. But we didn’t. We can do that Monday. Today? 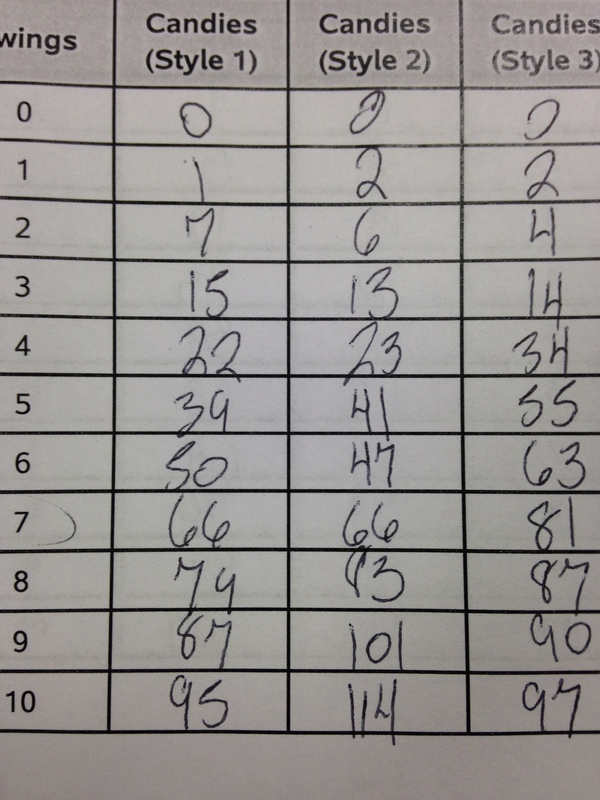 Today was a day for data collection. I thought students would need laptops since… you know… keyboard… space bar. As it turns out, Google’s one step (well, maybe more than one step) ahead of me. The game works on smartphones! I have no idea if this will be useless, but I made this video at lunch to introduce the problem. I was pushing to get it ready in time for my eighth period Precalculus class, so it’s pretty simple. We wrapped up our lesson with about ten minutes left in class. 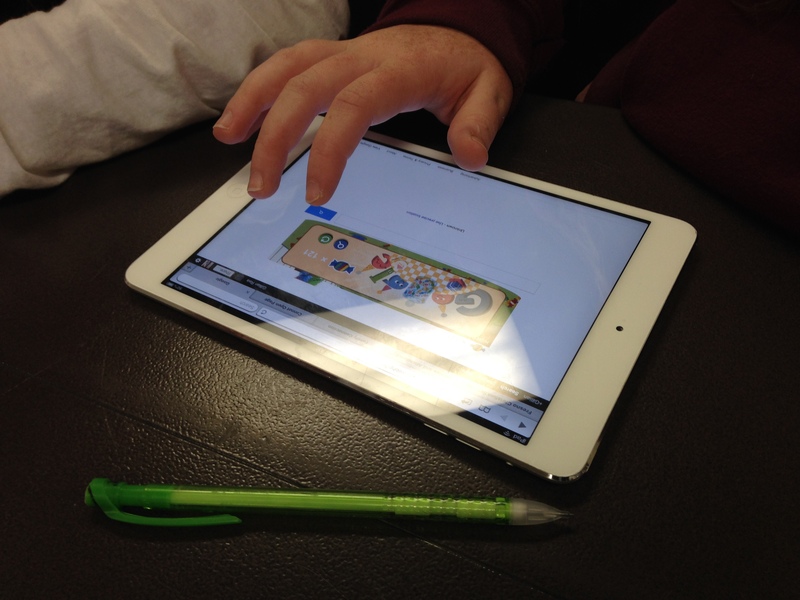 I played the video (above), asked students to pair up, take out a device, and get cracking. They obliged. Find a class, friend, spouse, neighbor, or stranger. If I even get a little bit of data, I’ll turn this into an activity or two for every class I can in the 7th through 12th grade sequence. I can already think of a few tasks for Algebra 1 through Calculus, but would love to hear your ideas if you have any. What should we do with all of this data? Drop a line in the comments and let me know. New here? Check out the background to this series before you dive in. 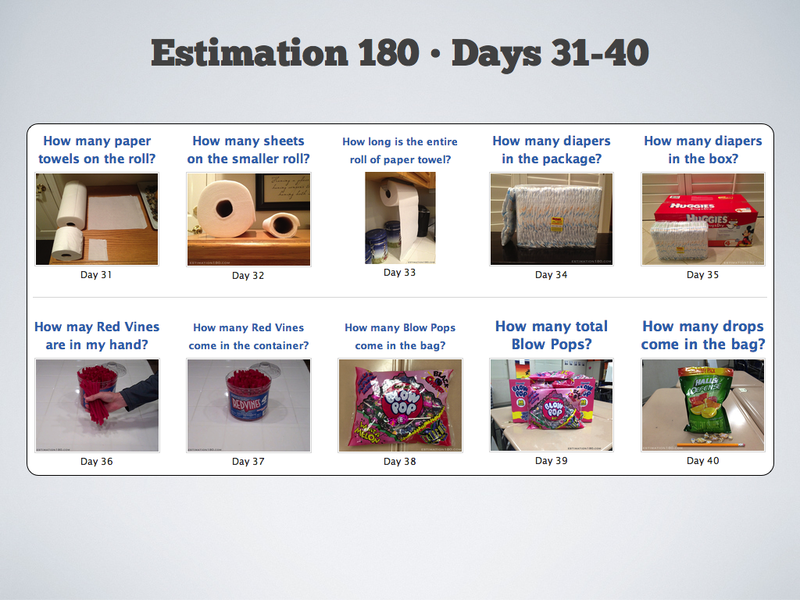 Once again we’ll get things rolling with some MATHCOUNTS problem solving and Estimation 180… er, well… estimation. We’ll also continue the “Four Big Ideas in Algebra” conversation. After two weeks of Warm-Ups we’re ready for our first Workout. Still need a copy of the handbook? It’s right here, it’s awesome, and it’s free. We’ll spend a few minutes discussing our reactions to the Session 2 reading assignment (a Grant Wiggins blog post), including any affirmation, surprises, disagreement, new insights, or new questions that came up in the course of reading the post and its comments, and writing a comment of our own. For now, we’ll leave the larger “Four Big Ideas” conversation alone until a later session. I’ve tweaked the new handout a bit based on a comment from the class in the Session 2 Feedback Form. Here’s the latest and greatest version. No time for a new style of visual patterns (we’ll continue pressing forward in a week or two). For now I want to camp on linear growth a bit longer. Instead of giving a few new challenges from the website (or of my own invention), I have a “create your own” assignment for each member of the class. Details below. 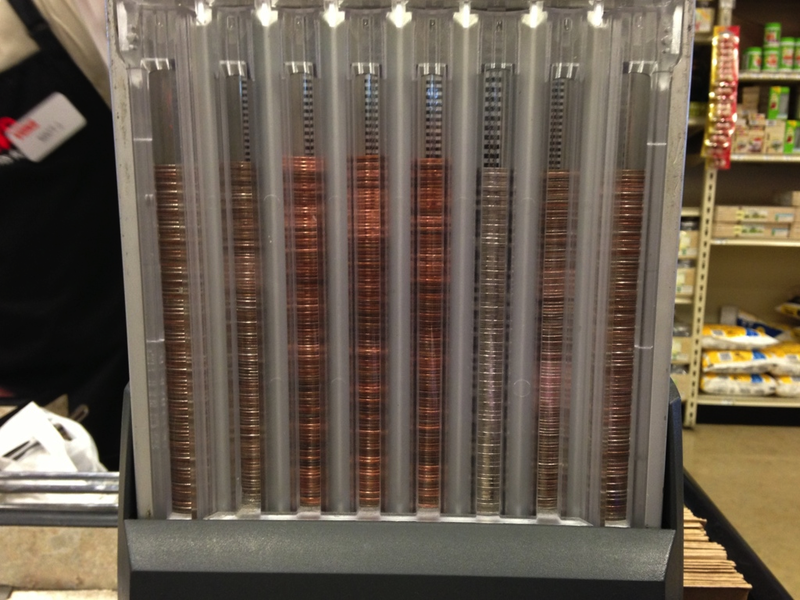 What’s the total value of those coins? 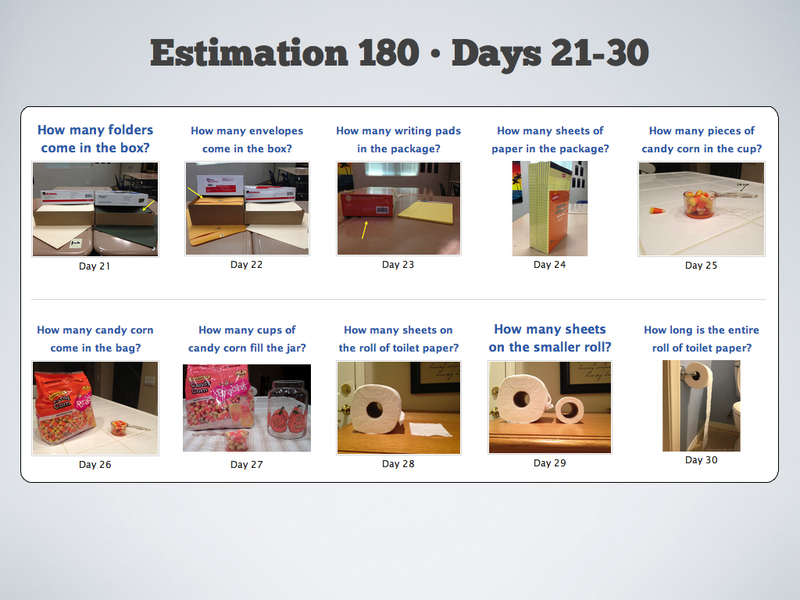 I’ll add a full length blog post about how my thoughts grew from “Hey, this is a cool estimation task” to “Whoa, this could be a pretty sweet three act task if I don’t blow the presentation (like I usually do).” For now, check out the resources I’ve posted for this task over at 101qs. 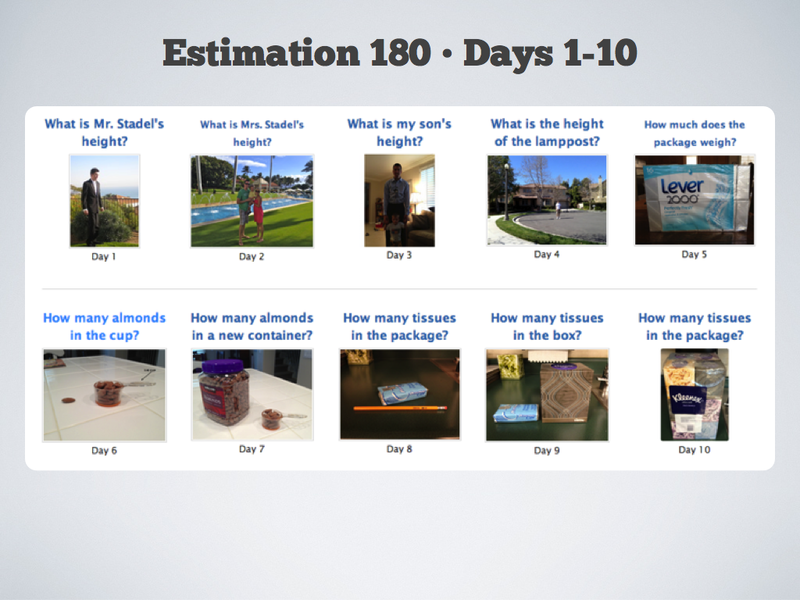 Earlier this year Dan Anderson, Justin Lanier, and I launched a website called Daily Desmos. Each day we (or someone else from our awesome and growing authoring team) creates one basic (er, well, not so basic) and one advanced graphing challenge. They’re fun to make and fun to solve. 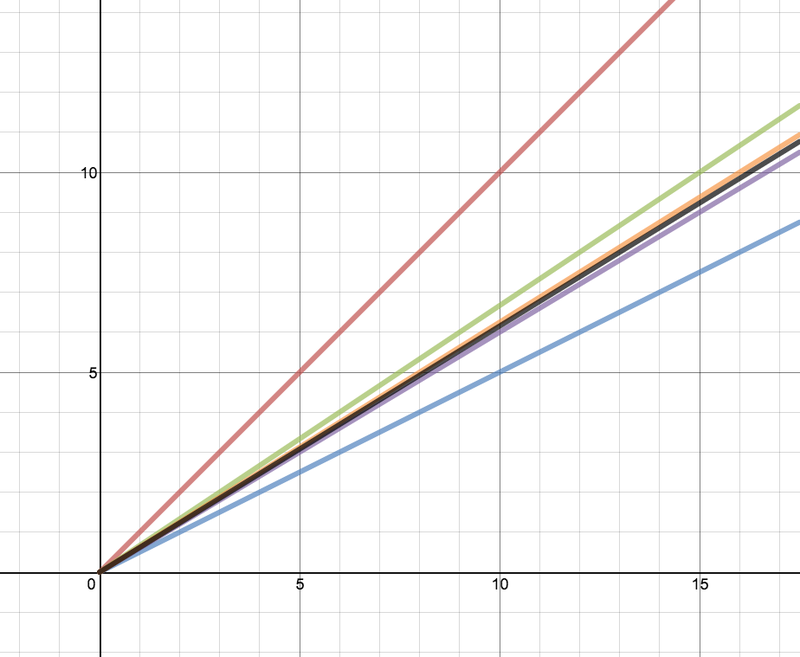 At any rate, because one of the major themes in Math 753 is proportional reasoning, and because we’ve been discussing creating a sequence of linear graphing challenges, I created a sequence of proportional graphing challenges (some might use the term direct variation). I’m waiting for feedback on the quality (or lackthereof) of this sequence. Once we’re happy with the quality and format, we’ll turn our attention to a linear sequence, then (probably) quadratic, and so on. Since we ran short on time in the first two sessions, I want to revisit the first four stories in Session 3. Soon we’ll continue moving forward, and soon after that we’ll have an assignment where each of us (myself included) has to create our own 15 second graphing story (or two). Read the four posts above, including all of the comments. Spend at least 24 hours with the ideas bouncing around your brain. Add your own voice to the conversation by posting a thoughtful comment, either on one of the blogs above, or on this post. Things to discuss might include (a) your latest list of four big ideas in algebra, (b) ways in which your list is being reshaped as a result of reading several more perspectives, (c) new questions or confusion you have about the big ideas in algebra, (d) new clarity you have about anything related to this discussion, and (e) anything else that comes to mind as a result of the reading assignment. If you’re just joining us, check out the background to this whole experiment, as well as the Session 1 post. 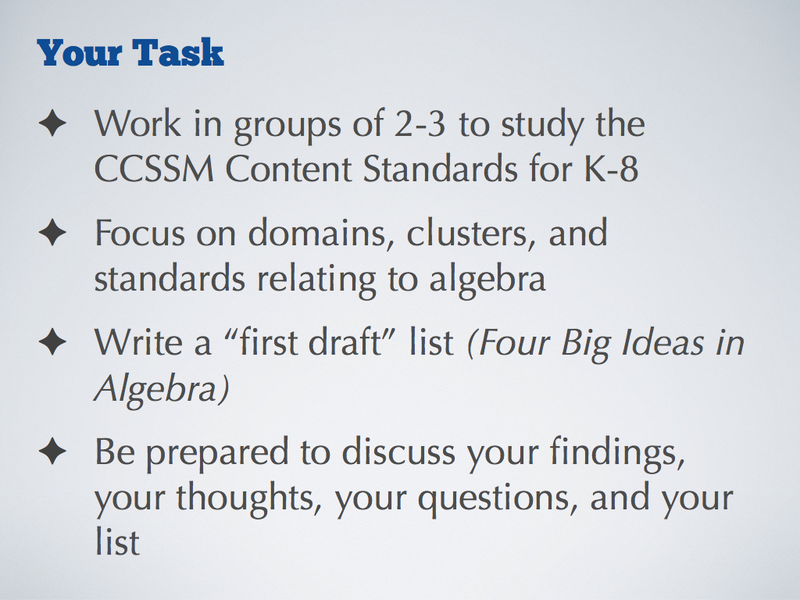 Additionally, we’ll begin digging into the CCSSM Standards for Mathematical Content (what I’ll refer to from now on as the “CCSSM Content Standards”). We got our wheels turning by working through problems from Warm-Up 2. Need the handbook? Get it here. I’ve really enjoyed working through every challenge in my fourth period class this year (we’re on Day 16 on the 16th day of school!). We don’t have enough sessions to do the same thing in Math 753, but I want the teachers to have a sense of the types of challenges we’re skipping over. 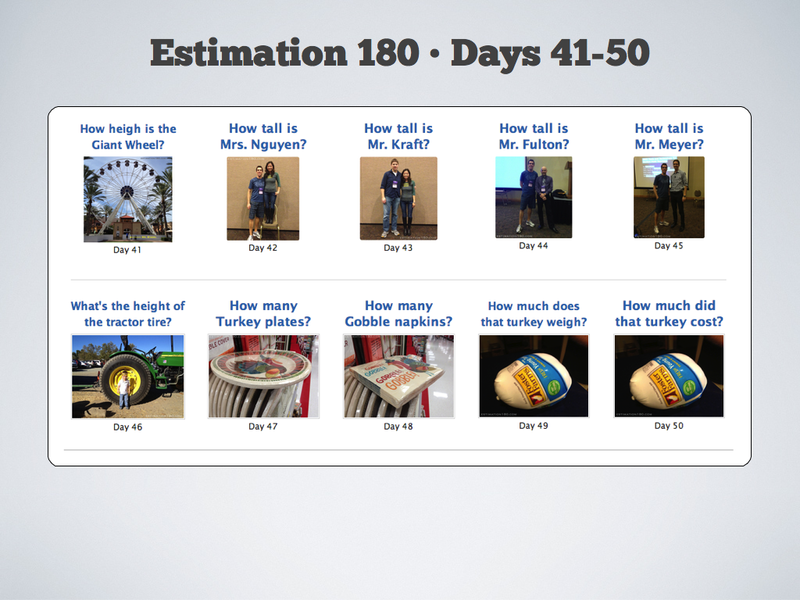 I’ve provided a two-slide preview of the Day 1-10 and Day 11-20 challenges in the hopes that they’ll be drawn back to them later (either on their own or with their students). I’m excited to bring the next pair of Running Game challenges to the class, partially because the challenges increase slightly in difficulty with each pair of days, but also (and primarily) because I have a shiny new handout. In the first session we explored several proportional relationships. (Check the Session 1 slides for specifics.) In this second session we’ll branch out to look at patterns involving a steady rate of increase with a slight shift away from simple multiples. 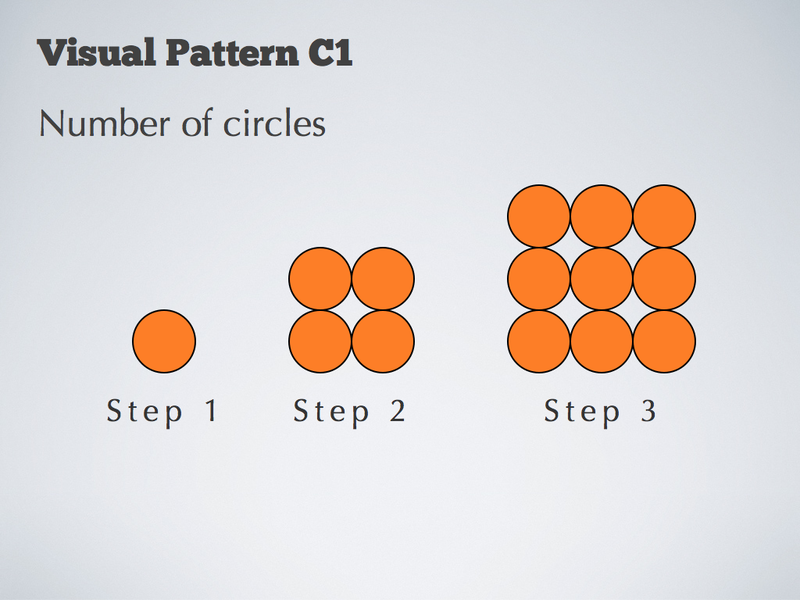 For example, instead of 3, 6, 9, 12, etc., we might look at 4, 7, 10, 13, etc. If that makes no sense, check out the Session 2 slides. In last week’s session I introduced a half-baked task based on caloric content of beverages at the In N Out soda fountain. The task was mediocre, but the context (in my opinion) had some merit. With that in mind, I’ve revamped the task. The focus now is on making connections among multiple representations. Water volume (by Esteban Diaz-Ibarra) and Distance from center of carousel (by Adam Poetzel). 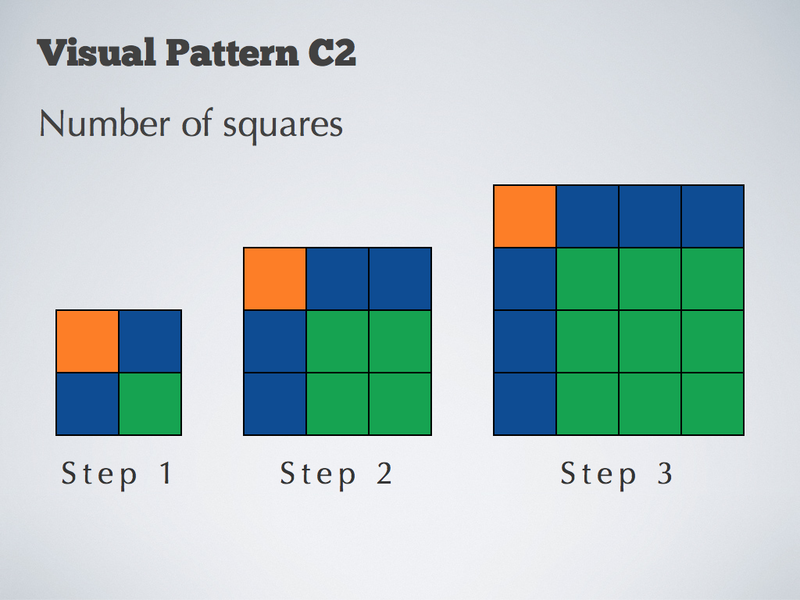 Compliments of course to Dan Meyer and BuzzMath for the excellent resource. Here is a thought experiment: can you identify 4 big ideas in algebra, ideas that not only provide a powerful set of intellectual priorities for the course but that have rich connections to other fields? Doubt it. 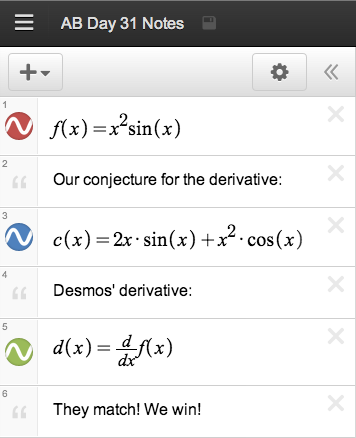 Because algebra courses, as designed, have no big ideas, as taught, just a list of topics. Look at any textbook: each chapter is just a new tool. There is no throughline to the course nor are their priority ideas that recur and go deeper, by design. In fact, no problems ever require work from many chapters simultaneously, just learning and being quizzed on each topic – a telling sign. Spend at least 24 hours with the ideas jostling around in your brain. Add your own voice to the conversation by posting a comment, either on Wiggins blog, or here. Things to discuss might include (a) your own list of 4 big ideas, (b) ways in which your list is being reshaped as a result of our class and the discussion started by Grant Wiggins, (c) questions you’ve always had about the big ideas in algebra, (d) questions you never knew you had until now, and (e) anything else that comes to mind as a result of the reading assignment. Never used Twitter? Get your toes wet by exploring Grant Wiggins’ timeline. 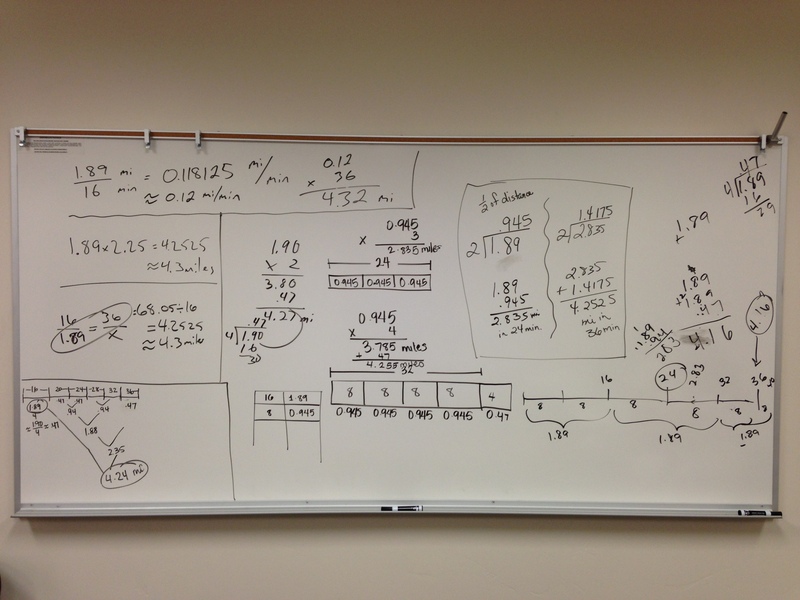 Keep your eyes out for new threads and clarifying comments in the “big ideas in algebra” conversation. Don’t worry if you get distracted and fall down a few unrelated rabbit holes. Part of the beauty in the conversations on Twitter is that you can find millions of different topics, discussed at varying levels of intensity, and they’re often just a click or two away.